Cuzco School Painting of Virgin Mary in Ornate Frame, 19thC. Please refer to our stock # W-WD2 when inquiring. 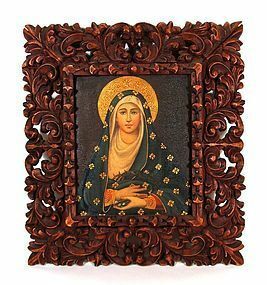 DESCRIPTION: A fine Spanish Colonial Cuzco School painting of the Virgin Mary, originating from Cusco, Peru. Here Mary is depicted with a golden halo looking straight at the viewer, wearing a royal blue robe with gold floral accents. In her hands she holds the crown of thorns and nails; however her image is not one of sorrow but of great peace and serenity. The painting is enclosed by its original, reverse-slant carved and pierced frame, very characteristic of the elaborate carvings made by indigenous Peruvian craftsmen. Signed on lower right by Antonio Carmen and dating from the 1800's, the painting is in very good condition. The frame has a slight separation at the top corners but is stable. DIMENSIONS: Painting is 9 1/4" high (23.5 cm) x 7 5/8" wide (19.4 cm). With entire frame, 17" high (43.2 cm) x 15 1/4" (38.8 cm) wide. THE CUZCO SCHOOL: The Cuzco School (Escuela Cuzqueña) was a Roman Catholic artistic tradition based in Cusco, Peru (the former capital of the Inca Empire) during the Colonial period of the 16th, 17th and 18th centuries. It is considered the first artistic center that systematically taught European artistic techniques in the Americas, and was the most distinctive major school of painting in Spain's American colonies. In the Colonial period, the Spanish sent a group of religious artists to Cusco, who then formed a school for Quechua and mestizos peoples, teaching them the techniques of drawing and oil painting. Soon, Cusco became the main art center in the Andes highlands. Eventually it spread to other cities in the Andes, as well as to present day Bolivia, Ecuador and Mexico. This Spanish colonial art flourished in the New World where the native artists developed distinctive regional styles by combining native subjects with European artistic traditions. Native and mestizo artists transformed the formal and iconographical styles of European art to create a uniquely American style of religious painting. Favorite subjects included biblical narratives, hieratic figures of the Virgin and saints, and elaborately dressed archangels. Cuzco School paintings are characterized by their lack of perspective (giving them a flattened spatial appearance) and the predominance of red, yellow and earth colors. They are also remarkable for their lavish use of gold leaf overlay (brocateado de oro), a strong decorative aesthetic, and idealized landscapes that often include brightly colored tropical birds.